Today is the 2nd Annual Pet Blogger Challenge, hosted by the wonderful, inspiring, and adventurous Amy Burkert of GoPetFriendly.com and Edie Jarolim of Will My Dog Hate Me?. Last year, Amy and Edie kicked off the 1st Annual Pet Blogger Challenge after Amy posted a piece called Bullied By The Blog. Figuring that they couldn’t be the only ones bullied by their blogs, they created the Pet Blogger Challenge and asked other pet bloggers to join in. Each blogger was asked to answer eight questions designed to introspectively think about their blog – from the reason they started it to where they saw it going. Here is last year’s entry into the Pet Blogger Challenge. My goal last year was to blog more about those things I thought might interest my clients (including doing more product reviews). Although I had initially started my blog to share pertinent information with my clients, I found myself blogging more about topics that interested me. My goal was to get back to a more client-focused blog and be a resource for my clients. Yes and No. After a lot of thinking and self-reflection, I decided to close down my business in April of 2011 and go back to work in the corporate world. It was a really tough decision and one I’m not really sure I am able to accept, even now. As a result, my goals for my blog changed quite a bit. Instead of being client-focused, my blog became a sort of hodge-podge of the serious and the fun – pet ponderings, videos, pictures and deeper examination of some important animal welfare issues, etc. To be honest, I feel like my blog has a bit of an identity crisis, but then again, so am I. I’m still trying to decide what I want I to be when I grow up and I think my blog has been a reflection of that this past year. 4. Has your opinion of blogging on a schedule or as the spirit moves you changed? Yes. Which are you doing now? I am blogging on more of a schedule now whereas before I used to blog whenever the spirit moved me. It’s been quite a change for me and I’m not sure I like it. I’ve actually been giving this issue a lot of thought lately because I’m not sure I am happy blogging 7 days a week. In fact, blogging on such a regimented schedule leaves me feeling less satisfied and feeling more like I am being bullied by my blog than I ever did before. Do you still worry about lost traffic, momentum, etc? I never really worried about traffic and momentum last year since the purpose of my blog was not to gain a huge list of followers but to be a resource for clients. I didn’t become concerned with traffic until I joined Triberr. Suddenly, I was seeing stats I had never seen before and I felt the need to keep maintaining those numbers. I cannot tell you why. However, I am starting to rethink this whole Triberr thing and the need to increase my stats. I find that I am interacting less with the people I used to love talking to on Twitter and instead, I find that I am using it more to just spread my blog posts around. I’m not sure that is where I saw myself going last year. Now, I am rethinking everything. What is it that I want to get out of blogging? Is it numbers? Or interaction? Can it be both? Has this changed since last year? No. But, I also haven’t really tried. If not currently, do you hope to in the future — and how? Maybe. This is something I am still exploring. How much time do I want to dedicate to this? It’s a question that goes round and round in my head. I still haven’t decided on an answer yet. Not much. I still like the fact that blogging allows me to express myself creatively. It also feeds my need for doing research – something I love doing. It also gives me a voice and a way to interact and learn from others. I have been so lucky to have so many wonderful followers who have left comments that made me think or made me reconsider my view/approach or who have inspired me to want to do more. I still dislike blogging on a schedule and trying to meet a deadline. Yes and No. I think I wrote some powerful posts that stayed with me for days and I think I’ve written some crap too. I feel very much that my blog has lost it’s way and I need to redefine it before I can look back and know if last year was a year of progress. I hope to have a more focused approach and be blogging less. We shall see! 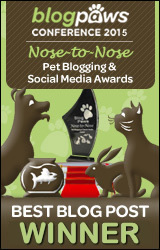 Categories: Blog Stats, Pet Ponderings Tags: Amy Burkert, blogger challenge, Edie Jarolim, Go Pet Friendly, Pet Blogger Challenge, Will My Dog Hate Me? When I think about this past year on your blog, Mel, my focus immediately turns to Lady’s story. Though you may feel your blog is scattered, you made a huge impact on many, many people by blogging about Lady’s adventure and eventual homecoming. My advice is to go with your gut – don’t force it – and blog about the things you love. Thanks for participating in the challenge! Your blog has offered a variety, Mel, which has kept it interesting and fresh! And when it came to subjects you’re personally very passionate about, like puppy mills and your lovely Lady, well – you totally rocked it. I don’t think you should restrict yourself with either concerns of the blog’s “identity” or a strict schedule. No Dog About It Blog has been a reflection of the beautiful spirit of its author. And as a friend of hers, I’d readily attest to that greatness! p.s. Triberr sounds terrifying. i think i’d best stay clear of that lol. I’ve loved the personal touch on this blog — the passion and, occasionally, the drama. There are plenty of “service” blogs. This one provides a lot more. I know about the choice between social media and blogging, but I think pouring your time into a blog is more worthwhile, because it’s a permanent record. Well, ok, social media is permanent too — but not always in a good way! It’s great to visit your blog because many of your comments resonate with me. Thanks for sharing! I wouldn’t worry to much about the purpose Mel. You are the blog. My guess is we are all reading this blog because of that personal touch you give to it. Not many have that gift, cherish it instead of fighting it would be my 2 cents. You’ve brought up some really great points and now I am regretting not reading your post before writing my own. I feel a lot of the same things about blogging that you have expressed here. Finding balance between work and life and family and training and blogging and eating cheese is not easy. It’s among my goals for this year. But I think I like what you have done with your blog, even if its original purpose has changed quite a bit. Though I am sure there is much you hold back, I feel like I have gotten to know you this year, a lot better than if your blog had remained focussed on one specific thing. I do think blogging can be about numbers and interaction, though I have no idea how to achieve that. Hopefully if we can focus on the latter, the former will just happen on it’s own? That’s what I am going to attempt anyway. Thanks for sharing so much of yourself! I hope you find your way again in the coming year. As for focus, I always think I’m scattered too. But I’m learning to just go with it – maybe that would work for you too? After all, I love coming to your blog and reading what you’ve posted that day simply because it’s you. I love your blog! I love the fact that you blog about what you’re passionate about, and not about… I don’t know… products or toys just because you think you should. When Lady was lost I posted messages to my Facebook page, even though I only know one person in Minnesota besides you! Don’t change a thing! Love you just the way you are! Mel, the delight I take in your blog is you. I come for the passion, the important issues backed up by thorough research that always teach me something new, and I come because you make me laugh. I feel like we’re neighbors, and I’m popping over for a terrific conversation – whatever the topic of the day – over a spot of tea. Give yourself a blogging break. Your focus is very clear. You love and strive to improve the well being of animals. I’m pretty sure you don’t have to hone anything beyond that. I have written and erased this comment seven times (sometimes the words just won’t come out the way I want!!) I love your blog because it’s honest and from the heart and it shows 🙂 Keep up the good work!! I am right there with you with the stress of blogging on a schedule. I feel that sometimes it takes the fun out of it, but then again it is good to have structure.It’s a toss up for me. I think blogs are like living beings, always growing and changing! I also think each one is unique and what works for one doesn’t necessarily work for another. As long as you feel like it works for you, the rest isn’t important! As always, words of wisdom. Thank you Carrie. I didn’t even know that you closed down your business. I thought that you were just not blogging about your pet clients anymore. I like your blog because I get most of my “puppy mill” and dog welfare info from you. I feel that you have great insight into these issues since Daisy actually came from one of those awful places.Your passion for the doggies shines through in your posts and I really admire that. Nope. Closed it down and went back to corporate America. I would be blogging about my clients all of the time if I had stayed open. I’ve visiting from the Pet Blogger Challenge and love your blog! I’ve just started mine recently so honest answers like you have given are really helpful to newbies like me. Your Daisy is so sweet and looks like a bigger version of my Daisy who is also a rescue pup. Wow. Thanks Woof Woof Mama! I try to be as honest as I can be with both myself and others. I don’t always succeed, but I think truth is better than lies. You’re right. Your Daisy looks a lot like my Daisy. I wonder what her breed is? The joy of coming late to a post is reading all the wonderful comments. I hope hearing from your readers lets you know that you can do whatever you need to do and know that people are supporting you. Thanks Pamela. I think I’m going to stick with what makes me happiest. Blog when the spirit moves me and worry less about the numbers. Although one of the major reasons I first started blogging was to catalog Daisy’s progress, I seemed to have forgotten that the other major reason I started blogging was to be able to write. Spending all my time trying to come up with a topic so I can meet some unrealistic goal I set for myself doesn’t make a whole lot of sense. I would rather write about things I am passionate about and blog less. We’ll see how things go! I think it’s great that you want to be a resource for your clients.. some of the most successful blogs are resource based! I think you should still keep in some information about stuff that you like though too, because it’s so interesting to hear your point-of-view… just a thought 🙂 Regardless of where you choose to take your blog, I look forward to your posts in the future! Thanks LizAnn. I so appreciate your comment and thoughts on this. I think I prefer having more of me. It feels more real and less forced to me. Aw, I love your blog and what a champion you are for rescues and against puppy mills! Pretty sure we will all be into whatever you write and when you want to write it! I’m a regular reader of your blog, and I like the ‘hodge-podge’ that it is. I also like that you use the term ‘hodge podge’, too. Now, this Triberr thing. I’ve been trying to get into it but it just won’t recognise my Twitter details, and that seems to be all it wants to do. You obviously had any issues like that? I wish I could help on the Triberr thing, but I am technologically challenged when it comes to Triberr. What I did notice is that using a different Twitter a/c and email helped. Maybe that’s the trick? I found you through the Pet Blogger Challenge. I can totally relate to your point about “What is it that I want to get out of blogging? Is it numbers? Or interaction? Can it be both?” I’ve always kept an eye on my numbers (I’m a statistics guy), but I’m going to make a concerted effort this year to build relationships and foster interaction with my audiences on my blog, facebook, twitter, and youtube. Best of luck to your blog finding it’s way! That was really honest and some of what you said resonates. I think we (on our end) worry a little too much about the usefulness of the blog. We should focus more on the enjoyment of the creative writing side. Sorry we missed the Challenge. Wordless Wednesday #74 Dog Cloning: Surrogate Mom to Dog Meat?